the vegetable orchestra plays music exclusively on vegetable instruments: carrots and cucumbers instead of guitars and drums. or, with their new cd automate, a cuke-o-phon and radish-marimba instead of laptop and sampler. the music presents a transfer of electronic music pieces and structures to the instruments of the vegetable garden. 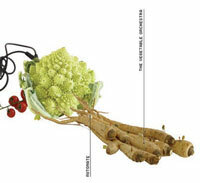 automate presents the vegetable orchestra’s second cd and their logical further development. the work on the organic sound bodies and refinement of the playing and recording techniques have made audible a new vegetable sound universe. Along with cover versions of Kraftwerk, the cd is a compilation of tracks influenced by the most diverse contemporary electronic music styles. an amazing affinity of the organic and digital world becomes clear on the one hand whereas on the other, an unmistakably unique veggie sound is created, which could not have been created with any other group of instruments. for several months prior to the studio recording, the 10-member ensemble composed and arranged the pieces, and most importantly, discovered instruments. Inventions such as a radish-marimba and a water radish were added to such long-standing sound generators as the cuke-o-phon and the carrot recorder. the compositions range from rhythmic house tracks to noise music to dub and glitch pieces. the vegetable orchestra, which comprises 9 musicians and a sound technician, was founded in february 1998 and has played numerous concerts throughout europe. the cd gemise was recorded in 1999.